ar: 1.67 4th gear: 1.23 5th gear: 1.00 6th gear: 0.83 It is the same transmission used in the E39 540i, but some changes were made to cope with the extra power the S62 engine produced. A reinforced clutch, rear differential utilising a shorter 3.15:1 ratio, and a limited slip differential with 25% maximum locking. 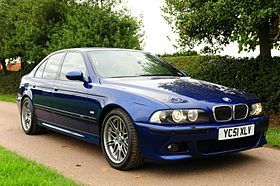 The E39 M5 suspension shared its basic aluminium-intensive MacPherson strut/multi-link design of the V8 engined E39 5 series. However, several changes were made by BMW M. Reduced spring height, 23 mm (0.9 in) lower. A specific shock valving, thicker front and rear anti-roll bars, polyurethane auxiliary springs, and steel balljoints. Like all V8-powered E39 models, the E39 M5 was equipped with a recirculating ball steering system. Overall steering ratio was reduced to 14.7 from 17.9. It featured a Servotronic vehicle-speed-sensitive power assist which provides two levels of resistance controlled via console mounted Sport button. The Sport button also adjusted the electronic throttle butterflies for faster throttle response. The E39 M5 is equipped with four-wheel vented disc brakes measuring 345 mm (13.58 in) in diameter in front and 328 mm (12.91 in) in diameter in the rear. On European-specification models, the rotors are of a "floating" two-piece design for reduced risk of cone distortion. Their lower unsprung weight improves ride quality and traction on bumpy surfaces as well. Anti-lock brakes, EML (fly-by-wire) throttle control and Dynamic Stability Control (DSC) were standard.